I first discovered Greg Leitich Smith in an anthology, Geektastic, about 6 years ago. From that anthology I have read books by many of the contributors, but Greg and his wife Cynthia are among my favourite contributors. At that time a few of Greg's older books were out of print, but he had new books in development. I have read all of his books and enjoyed them greatly. And thankfully they are all back in print now. 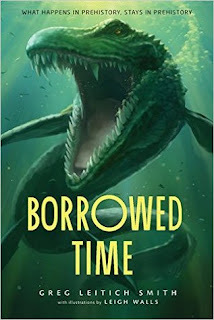 In this book Max and his friend Petra travel back in time to the Cretaceous period. While there they encounter Max's uncles Brady and Nate. This book is a little different than the first one in the series. In part because all of the family members are aware that time travel is not only possible, but it is also something that many of them have done. Also in this book we end us with multiple loops in the time line. With some surprising twists. A big dilemma faced this time is faced by the children is what to do with knowledge about when Uncle Brady died and how. Another interesting twist is the children spending a few days in the past with their uncles when they are much younger than they ever knew them to be. It was very interesting watching the various characters from different times interact in a place and time well before their own. The loops in the timeline and repeat trips do get a little confusing. But overall the story is very well written. As stated I have read all of Greg's books. This one in my opinion is not his best, but it is still a very good read. I wonder what Greg would do with some of the other characters we only encounter for short periods. I also wonder what read we will get next from Greg. 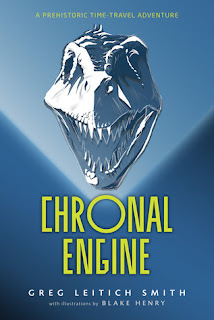 A good book but make sure you read book 1, Chronal Engine first.